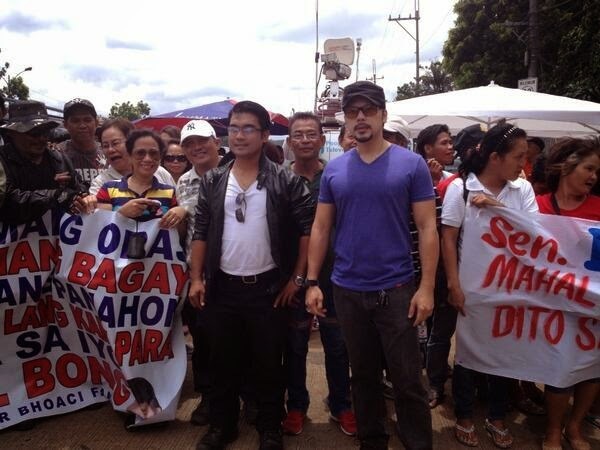 Manila, Philippines - Aside from the immediate family of Senator Ramon 'Bong' Revilla Jr., a look-alike of him and another celebrity impersonator went to the Sandiganbayan on Friday to express support for their idol. Esmeraldo Valencerina, a look-alike of Senator Revilla said he would even be willing to replace Bong in the detention cell. Valencerina is accompanied by Jonathan Garcia, who impersonates actor Christopher de Leon, who won the Ultimate Kalokalike prize for being the spitting image of the actor. Christopher de Leon is a close friend of Revilla. Revilla surrendered to the Sandiganbayan after the anti-graft court's First Division ordered his arrest in connection with the 10 billion-peso pork barrel or PDAF scam. On Friday night, the Philippine National Police - Public Information Office (PIO) has released mugshot of Revilla and some photos of him while undergoing booking procedure at Camp Crame, Quezon City. Revilla was detained at the PNP Custodial Center in Camp Crame.